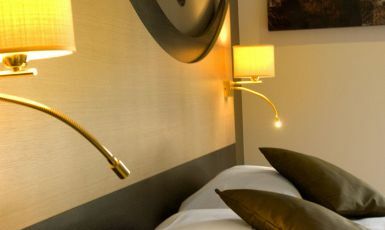 Choose to stay one or several nights in one or several of our 18 apartments are available all equipped with the latest technical innovations. Our T2 (one bedroomed) apartments are between 30 and 34m2 and are available from 135€ per night. Surrounded by nature, spend your holiday in Provence warmed by the Southern sun. You can also stay in one of our 18 apartments, all with fitted kitchens, with or without a private terrace. You can choose to cook what you please in your apartment or eat out in the surrounding area. The closest restaurant l'Auberge La Bastide Enchantée is just a couple of steps from your room! 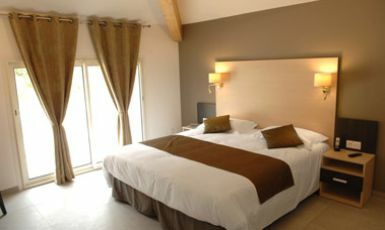 In singles or doubles, all our beds are equipped with SIMMONS mattresses and slatted bed bases. Sleep in the best of comfort! 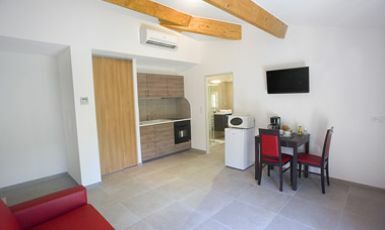 Would you like to enjoy the comfort of our apartments and ensure your holiday in Provence is a most pleasurable one? Our booking system will give you the real time availability of our appartments, with or without terrace. High Season (from 27 June to 16 September 2018). Breakfast is at an extra cost of 8,50€ per person, per day.